Write Arresting Headlines And Create Dynamic Spin… In Moments! Public Relations is often said to be the engine that drives a product or a company. 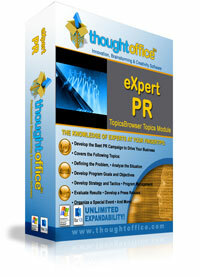 ThoughtOffice’s Expert PR Module is the engine that drives effective PR agencies worldwide. By providing skilled and relevant prompts, then filling in the blanks with powerful associations, Expert PR quickly helps PR pros assemble product prose in no time. And if you could arrive at effective PR solutions for your clients within minutes, what would that do for your business? With over 10,985,690 possible creative responses, we can’t list them all here. But you’ll get the idea.